Between the first trailer and the subsequent interrnational version that followed shortly after, we only recently got a good look at director Paul Feig’s upcoming Ghostbusters reboot. Much has been made of the casting, specifically the choice to have the core team played by women—Melissa McCarthy, Kristen Wiig, Leslie Jones, and Kate McKinnon—instead of men. We’ve gradually learned more about these characters, but it turns out, McCarthy almost played the role that eventually went to Jones. Actually, when Katie [Dippold, Feig’s co-writer] and I wrote the script, we had written the role with Melissa in mind, but then I thought I’ve seen Melissa play a brash, larger than life character. She’s done it in my movies before! Given what we’ve seen of the Patty Tolan in the Ghostbusters trailers, it’s not hard to imagine Melissa McCarthy in the role. With movies like of Tammy, Identity Thief, and The Heat on her resume, McCarthy has played similarly bombastic, over-the-top comedic characters many times. Hell, she’s played similar parts for Paul Feig a couple of times, as he points out. We know that Patty is a transit worker in New York City, and one early rumor even suggested that McCarthy’s character worked for the MTA. While that casting would have made sense, it’s also understandable that everyone involved wanted to go a different direction and try something less expected. 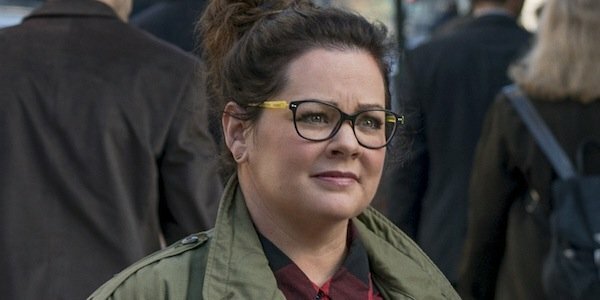 It’s probably a welcome change for Melissa McCarthy, who has been reaching into other territory from time to time with movies like St. Vincent, as well as giving Paul Feig the opportunity to direct her in a new way. But don’t worry, we’re sure there will be ample opportunity for Melissa McCarthy’s paranormal investigator, Abby Yates, to get in on the comedy. Just watching the first trailer should make that abundantly clear. What we know of the plot of Ghostbusters falls right in line with the 1984 original. Four unlikely weirdoes band together in order to battle the ghosts that are terrorizing New York City. There will, of course, be tweaks and changes and updates to the formula, but that is the general gist of the story as we understand it.